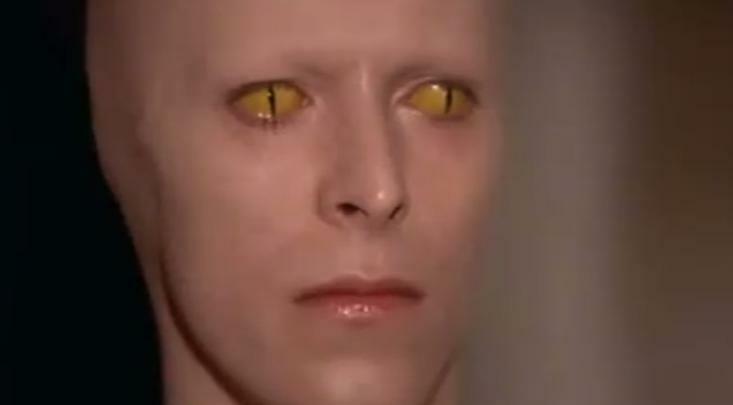 The Internet can’t resist a good conspiracy, and boy are people having a ball over Blackstar. Not sure about the Blade Runner suggestions, but I think this blog by Paula Young Lee deserves at least a second read. Interesting item here regarding the possible Elvis references in Bowie’s Blackstar. As you might have seen from my earlier post, I feel the ‘utter despair’ reading has to be reined in a little; Bowie was a master of ambiguity and nuance, and always left wriggle room as regards meaning. On the other hand, the Bowie/Elvis affinity is undeniable, as people have observed for a long time. I remember that Elvis/Ziggy magazine cover. I kept it for ages! When you consider the references—both subtext and direct—to things kingly in the imagery of Lazarus and Blackstar; as both pop stars share a birthday, you have to give some credence to the Elvis layer of meaning. In her book Stardust Angie Bowie writes that David could do a ‘devastating’ impersonation of Elvis; and there is a Christmas greeting from Bowie (which I am not sure is genuine) doing the rounds in a decent Elvis voice. There is some song in his catalogue too, I can’t remember which, where he does a passable Elvis for a few lines, I think it is on Young Americans. Is it too far to imagine that the white space suit in the Blackstar video, much repaired, has faint echoes of Elvis’ big elaborate white suit of his final era? Interesting that Bowie/Newton enters the closet at the end without looking around. By the way, the original inhabitant of the closet, the girl who ends up under the bed, has a special part in the earlier ritual. She is the one who carries the jewelled skull of the astronaut on her back. She seems to have a special role in transportation or guiding between worlds. Is she Hathor/Nut, the celestial cow goddess who bears Ra in his solar barque across the heavens? This goddess is traditionally depicted as naked, with her body covered with stars; she is the Milky Way, who in Ancient Egypt lined up with the direction of sunrise and sunset at seasonal turning points. In the video she has been clothed in a flowery (or starry dress). I suspect a reference here to Bowie’s own mother, as well as to Newton’s protector in the afterlife. The figures crucified are also blinded, or at least wear the blindfold and buttons. The creature that menaces them (carrying not a sickle, but horn, possibly a goat horn, and wearing a headdress not of dreadlocks, but tails) makes me think of W.B. Yeats’ The Second Coming, as the rough beast ‘slouches towards Bethlehem to be born’. Newton/Bowie communicates with the ‘cat goddess’ (if it is she), by blinking, too. Only last week I watched a TV programme called the Secret Life of Cats which explained that staring cats are showing you aggression, but that blinking cats are being friendly. (If you don’t know the film, Newton, the alien, when he takes his contact lenses out, has cat eyes). I need to learn more about the Goddess Bast! I am a musician, researcher and writer based in Leitrim, Ireland. I love ideas and initiatives, and am involved in a number of collaborations and research projects. I will fill this out more as I go along.